DOCTOR WHO: Companion Pieces - KAZRAN SARDICK | Warped Factor - Words in the Key of Geek. Tony Fyler mutters a ‘Bah, Humbug’ in sympathy with Kazran Sardick. A quote from Dinosaurs on a Spaceship of course, rather than A Christmas Carol, but it indicates a curious double-standard from the Doctor when it comes to the people with whom he travels. Almost as if it were intended to re-ignite the fan-debate over what constitutes a companion and what doesn’t, the Doctor indicates that there are ‘proper’ companions and ‘occasional’ companions, which is a bit rich when you consider that by the time he said it, he’d dropped off the Ponds in their real life, and only picked them up again now and again for isolated adventures. What then, are we to make of Kazran Sardick, a man whose life is relatively mercilessly messed with, whose whole personality the Doctor intends to change by virtue of time travel, ultimately so that at the particular point when the Doctor needs him to be a nicer person than he is, he will be, opening up the clouds on the planet of flying sharks, to allow Rory and Amy’s ship to land safely, rather than crashing and killing them both. Is Kazran ‘just a person’ or is he a proper companion, like the Ponds? 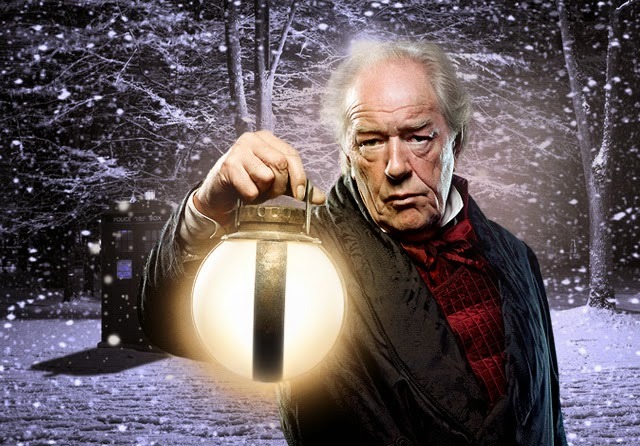 Ultimately of course, he’s Ebenezer Scrooge in a Doctor Who style. When we first encounter him, he’s a heartless old man, caring nothing for anyone, and scarred by a past he keeps generally unknown to people. Perhaps understandably, the cleverest man in the room works him out in about three minutes flat. But understanding the original Kazran gives the Doctor an unusual problem – the universe is not black and white, not good and bad. 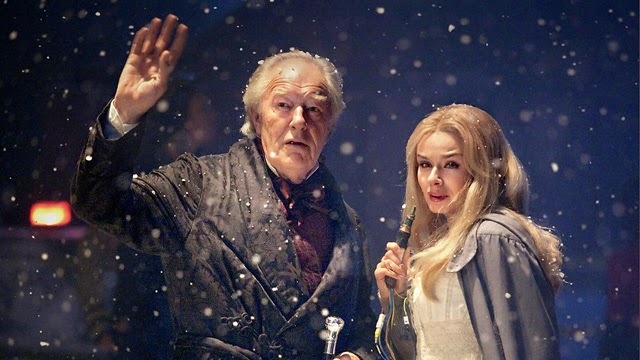 Old Kazran, it seems, was traumatised by his father, and the Doctor is catapulted back to his dilemma in Genesis of the Daleks – ‘If someone pointed out a child to you and told you it would grow up to be a ruthless dictator who would kill millions, could you then kill that child?’ Cause and effect are not the Doctor’s friends if he wants an easy life, but only because even Old Kazran, in his own splenetic rage, cannot bring himself to hit a child, cannot bring himself to take that last step and become the same man his father was. 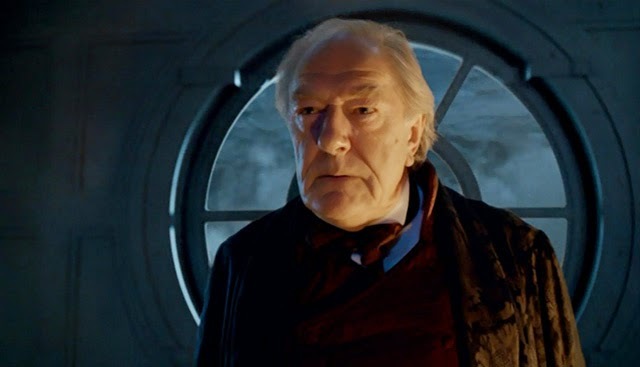 Not hitting the child is the loose thread that shows the Doctor there’s more of trauma and loneliness to Kazran’s cold persona than actual meanness of spirit – just as there was more of loneliness and ambition than actual evil in the making of Scrooge. Like a Ghost of Christmas Past with a time machine, the Doctor determines to save Kazran from the man he will become. And sure enough, when he meets Young Kazran, the Doctor is enchanted by a boy scared of his father, isolated by not having had an experience that all his classmates have had, but with a curiosity and a genuine interest in the world, and the floating fish, that the Doctor recognises in himself. When they’re attacked by a shark and the shark itself sickens, Kazran’s determination to try and save it is hot and desperate, compared to the Doctor’s realisation that it will probably die – a dilemma faced by parents around the world when their children bring broken-winged chicks in from gardens and look at them with those eyes so full of wonder and hope and ‘you-can-do-anything. Do this, please.’ The need for a cryo-chamber to preserve the shark and give it its best chance introduces Abigail to both their lives, and Kazran’s timeline is changed forever. He falls in love at a point when he still can, and between them they return the injured shark to the clouds to heal. But that’s by no means the end for Kazran Sardick. All year round, he lives the slow path, growing older in his father’s shadow, but every midwinter’s night, he waits for his special festive genie, and they free their very own singing snow-angel, and go and have adventures. In the ultimate case of a one-night love affair, as he grows into a fine-figured young man, it is Abigail who really holds the key to Kazran’s life more richly lived, not the Doctor. When finally they discover the mutuality of their love (while the Doctor goes and marries Marilyn Monroe), Kazran has the world on a string, and a bright, warm future ahead of him. Except he doesn’t. Abigail tells him the truth about why she was in the cryo-chamber in the first place – as well as being security for a family debt, she has an incurable disease. She has been using up her last days alive, compressing them into a stream of endless adventurous midwinter nights with Kazran and the Doctor. If she stays out of the cryo-chamber much longer, she will die. In fact, she has just one day of life left to live with him. 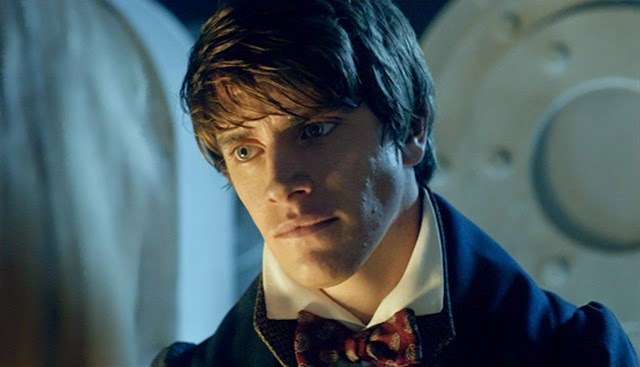 At this point, the question becomes not ‘Is Kazran a real companion?’ but ‘Is Kazran a bad man destined to happen?’ While the Doctor originally saw a thread of hope for him when he couldn’t hit a child, the adventures Kazran and Abigail have with the Doctor lead him to freeze – returning Abigail to the ice, he tells the Doctor to stop coming. There will be no more jolly japes. Kazran, like many a man and woman before and since, is frozen by the fear of love lost, of grief, of the inevitability of the death of one in whom his whole heart, his whole pathway out of the dark is bound up. Without her, he doesn’t have the strength to resist the shadow of his father, the coldness of his own destiny. The Doctor’s final bit of temporal chicanery though is a terrifying, cruel lifesaver. He shows Young Kazran what he’s destined to become if he cannot re-open his heart, if he can’t be brave enough to accept the transience of life and the transformative power of love. And Young Kazran is horrified, and determines to change. Before you write that off as a storytelling convenience, look at it through Kazran’s eyes – would the young you approve of the you you’ve become? Kazran’s an object lesson in the Doctor’s philosophy – live every day as well as you can, or you’ll live with the consequences of the opportunity missed. So is Kazran Sardick, the man who hates ‘Christmas’ when we first encounter him, a real companion? Possibly not – he’s more a means to multiple ends; the saving of the Ponds’ lives, certainly, but also the reclamation of his own. The Doctor gives him back the joy he understood as a young man, when he is an old one, and he and Abigail live their final night together well. More than anything, the time the Doctor takes with Kazran Sardick reminds both him and us that life is rarely straightforward, that people are complex, and that redemption and forgiveness are almost always possible. Kazran is a moral lesson to us all not to judge too quickly those who are grumpy or miserable, or want to be left alone, especially at this time of year. Until you’ve jumped in the Tardis and seen what made them the way they are, you may not know their whole story. Kazran Sardick, like Scrooge before him, lives potentially in all of us. Hold on to the Abigails in your life, the sources of light and warmth, and be one, whenever you get the chance. You don’t have a time machine, but you do have time – help a Kazran of your own, every day you can.